Google released a new version of Search for Android today, bringing devices running Android 2.2 and 2.3 into the world of Ice Cream Sandwich. The UI has been simplified and is also much faster than any versions before it. Faster, smoother performance, with an updated and simplified user interface. Suggestions for your search grouped by type, with web suggestions at the top. Country-specific suggestions and search results for all countries with Google domains. Long press to remove history items. 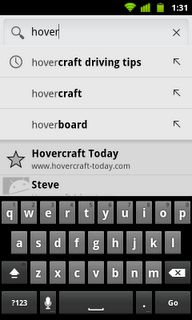 Tap the arrow to the right of a search suggestion or history item to add it to your search term before searching. Get suggestions from other apps on your phone – check out searchable items in Search settings. Long press on home screen to add the Google Search widget, if you don’t have it already, to access search faster.